The new Ford Focus Electric is now the most efficient five-passenger car in the USA reaching up to 110 MPGe in the city and 99 MPGe on highways, surpassing the Nissan Leaf by 6 MPGe. It also provides more power and more features in the standard model. The 2012 Ford Focus Electric also outperforms the Nissan Leaf in others things. It has more space for passengers and a faster charging system that allows a full recharge in about half the time of the Nissan Leaf. The Ford Focus Electric 2012 is the most fuel efficient car in America, surpassing the Nissan Leaf. Its registration approved by the Environment Protection Agency (EPA) also certifies that the Ford Focus Electric has a driving range of 76 miles on a single charge compared to the Nissan Leaf which provides a range of 73. These figures could represent savings of about $9,700 in fuel costs over five years compared with the average cost of a new vehicle. This saving would increase if the trend of rising gasoline prices continues. The new Ford Focus Electric interior offers MyFord Touch ™ with unique features that provide easy to understand information regarding scope, targets, and load points, enabling users to plan their trips without compromising driving fun. The Focus Electric has an advanced charging system with 240 volt outlets that can be installed in the garage of your home which allow the battery to be fully charged in four hours only. This may extend the handling range since drivers can recharge faster and many times a day. If you need to charge the car away from home, the number of stations is increasing. In 2011 the number increased from 750 to 5,507 according to the Department of Energy. In addition, the Ford Focus Electric has a Microsoft software designed to charge it with the lowest rates. Ford has 10 other vehicles that stand out for their high efficiency in fuel consumption, they are: Ford Fusion, Ford Escape, Ford Taurus, Ford Edge SUV, Ford Fusion Energi plug-in hybrid, the Fusion Hybrid in its 2013 model and the Ford Fiesta, the F-150 and the Ford Explorer in its 2012 model. I love my Ford Mustand! 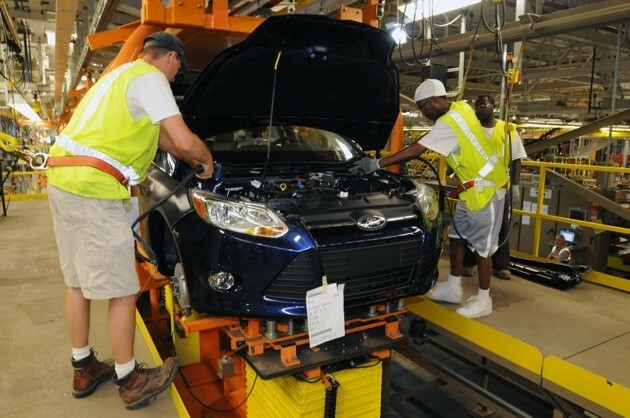 This new version of the Ford Focus will be manufactured at the Wayne, Michigan plant, which is supplied largely from energy produced by one of the biggest solar power plants in that state, so somehow its use and production moves towards the desired overall goal of zero emissions. This would be a dream for the Earth planet. Just to complement. Inside the cab, the Focus Electric owners can interact with a single execution of MyFord Touch, a modern system which offers new levels of customization of the vehicle information. Basic information such as the charge status of the battery, the distance to the loading point, the appropriate settings and everything happening in the electronic system of the car, is easily visible on full color LCD screens of 4.2 inches located on the sides of the speedometer which has been mounted in the middle. By using five functions buttons on the steering wheel, the Electric Focus owners can set up his own display of personal information in the left screen.